Editor-in-Chief Dr. Valentin Ekiaka Nzai, Texas A&M University – Kingsville, USA. 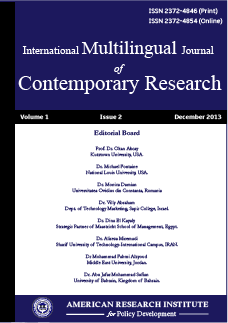 International Multilingual Journal of Contemporary Research is an international peer-reviewed Journal. It publishes research papers focused on contemporary issues from every aspect of the business and economics, humanities and the social sciences, and science and technology. This is the only journal of American Research Institute for Policy Development which is published in various languages as per the choice of the author. The journal follows double-blind peer review process. The journal seeks original manuscripts that provide theoretically informed empirical analyses of worldwide contemporary issues, as well as original theoretical or conceptual analyses. Each paper published in International Multilingual Journal of Contemporary Research is assigned a DOI®number, which appears beneath the author's affiliation in the published paper. Click HERE to know what is DOI (Digital Object Identifier)? Click HERE to retrieve Digital Object Identifiers (DOIs) for journal articles, books, and chapters. Dr. Valentin Ekiaka Nzai, Department of Teacher and Bilingual Education, Texas A&M University – Kingsville, USA. Dr. Yawo Bessa, Allen University, Columbia, SC 29223, USA. Professor Dr. Gloria Gempes, University of Mindanao, Philippines. Dr. José Matias-Pereira, Professor-Research, University of Brasília – Brazil. Dr. Natalia Skobelina, Volgograd State Technical University, Russia. Dr. Katya Georgieva Dishlieva, Technical University of Sofia, Bulgaria. Dr. Alireza Miremadi, Sharif University of Technology-International Campus, Iran. Professor Maria Rosário Justino, ISCAL- Polytechnical Institute of Lisbon, Portugal. Dr. Vijaylakshmi, JECRC University, Jaipur, 302023, Rajasthan, India. Dr. Zainab Fotowwat Zadeh, Institute of Professional Psychology, Bahria University Karachi Campus, Pakistan.